Kyoto’s ancient Gion district is famous for its geishas. Full of theaters, where geishas perform, the Gion also offers some of Kyoto’s best, and judging by the hoards of tourists who visit, worst dining. This is where my friend and guide Tomo and I had our first dinner in Kyoto – at Ifuki, a one Michelin-starred kaiseki restaurant owned by chef Norio Yamamato (where, as it turns out, we shared the counter with three businessmen and their geishas*). Despite the hushed formality of the restaurant, intensified for me by the fact that no one spoke English, Yamamoto’s warm smile and cheerful mood put me at ease. Following the traditional kaiseki philosophy, Yamamoto’s multi-course meal celebrated the season by showcasing its best ingredients; highlighting their texture, flavor, and color; and presenting it all artfully on beautiful plates. But, unique to Ifuki was Yamamoto’s use of live fire. Almost everything he served had, in some way, passed over the open flame that flickered on the grill all night. On top of excellent ingredients and simple, confident cooking, Yamamoto’s subtle use of smoke and char made this meal stand out. Of the dozens of meals I had in Japan on this trip, high and low, this one was my favorite. The meal started with a Hassun plate, which is traditionally composed of an assortment of cold dishes. This was followed by sashimi, vegetables (here, it was a fat, white asparagus dressed with a terrific fava bean and pistachio purée), and then soup. Because the Hassun plate was often the first, substantial course served in a kaiseki meal, I used it as a litmus test for how the rest of the meal would go. In my opinion, the Hassun is a particularly difficult dish to pull off. First, there are many components to the Hassun, all of which need to be prepared, and then properly stored, and then reassembled for service. Secondly, the Hassun plate is served cold. It’s harder to impress me with cold food than with hot food. Proteins lose their juiciness and sexiness as they cool and stiffen. Flavors tend to be more muted. And gone is the simple comfort of warmth. But, the Hassun plate at Ifuki was particularly great. Everything was nicely cooked and beautifully presented. The flavors were clean and clear. 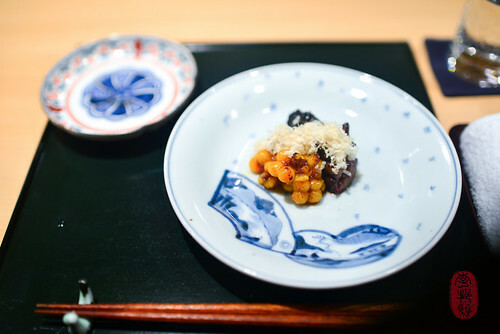 I particularly liked the lily root served with ume (plum), a marriage of crispy and tangy. I also loved the tender crunch of an emerald-green floret of rapeseed, the bitterness of which helped cut into the richness of a creamy ball of sea bream roe. It was clam season, so this meal (like most of the kaiseki dinners I had in the two weeks I was in Japan) leaned heavily on clams. 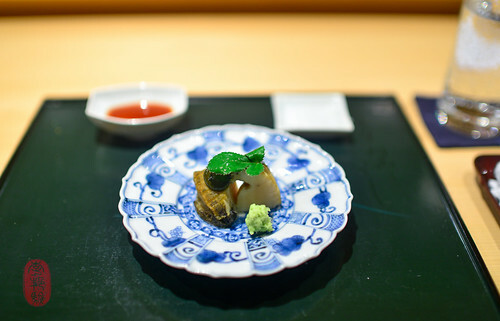 The most interesting one I encountered was the first clam that we were served at Ifuki (it reappeared the following night on the Hassun plate at Kichisen). This clam had a purplish-brown coloring, and its thin flesh had an unexpected snap to its texture. It appeared and tasted more like squid. Clam- a giant, meaty one – also starred in the soup course, which was a hot, clear clam broth. In the bowl with the clam were a marshmallow-soft block of mugwort tofu, a couple of tender fiddlehead ferns, and kinome, a waxy-leaf herb (you may be more familiar with it in its dried and ground form, known as sansho) with the strong scent of citrus, mint, and pepper. Kinome appeared often as a garnish throughout my trip. The two most-memorable courses from our dinner at Ifuki were the meat courses. Usually, there’s at least one substantial meat (or fish) course towards the end of the meal. 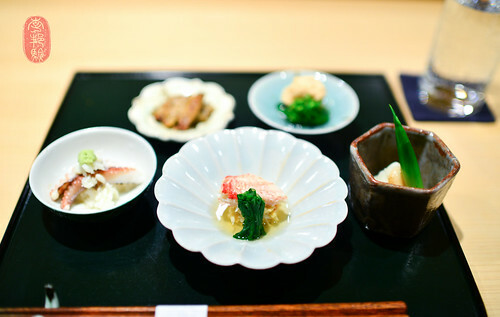 At Ifuki, we were offered a few choices for this course, which included both fish and meat. I chose the turtle dish. Tomo chose wagyu beef. Yamamoto coursed these two dishes out for us, sending them one after another as shared plates so that Tomo and I could enjoy them one at a time. Although my experience with turtle meat is limited, I’ve always found it to be tough and dry. Yamamoto’s turtle meat, taken from the neck, was surprisingly soft and juicy. Dark and rich, it could have been mistaken for a leaner cut of beef. It was served with grilled turtle liver and a cluster of its eggs. Since turtle eggs have shells, and these did not – they appeared to be merely yolks – I assumed that these were not fully developed eggs (but, what do I know?). The texture of the yolks was dense and creamy; they hadn’t been cooked long enough to go stiff or chalky. Owing to the richness of this course, the portion was small. And to help break the monotony of fat and flavor, Yamamoto topped the turtle with a generous grating of spicy horseradish, which I absolutely loved. Between meat courses, we were each served a beautiful, de-skinned cherry tomato that had been slightly warmed on the grill and dusted with truffle salt. It burst with juice, the gentle acidity of which helped clear the turtle to make way for beef. The wagyu beef arrived in three different cuts. The tongue and striploin were served with a bit of wasabi. The rump meat, which was left wonderfully rosy within, was served with miso. Each part was perfectly cooked and delicious in all the ways that you’d expect and hope from wagyu beef. After fish and meat, the kaiseki always concludes with a rice dish. A comforting reminder of my childhood and family gatherings, which always revolved around rice, the rice course was always my favorite one. 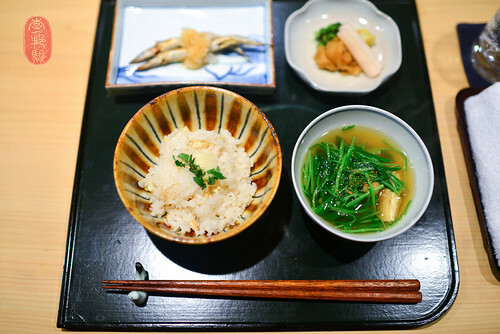 Yamamoto’s rice dish was simple, flecked with little more than bits of chopped bamboo and fried tofu. With it, came a warm broth with fried tofu and greens, and a side dish of pickles and another with two, small grilled fish. To close, Yamamoto presented us with a colorful assortment of melons, kiwi, papaya, and berries, glistening with honey jelly. It was light, bright, and refreshing. Luxury is not found simply in plushness or pleasantries. Without confidence and consistency, these are merely platitudes, deployed to distract and deflect. To me, luxury in dining is the ability to trust, and ultimately give yourself over to the chef and the experience without worry or want. 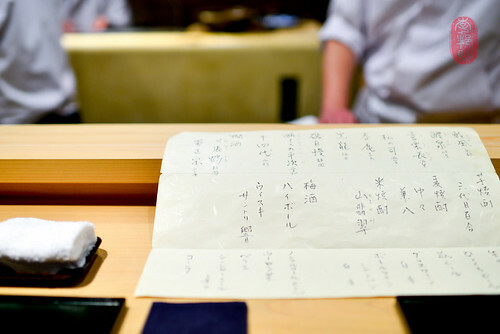 It is the thoughtfulness of Japanese chefs, like Yamamoto – their obsession over quality, detail, and consistency – that makes dining at their hands luxurious, despite the austerity, and sometimes, asceticism of the setting. And the incredible humility and softness with which it is delivered makes it all the more wonderful. Yamamoto bid us farewell at the door. And, in the tradition of a good host, bowed, and bowed again, until Tomo and I turned out of sight. 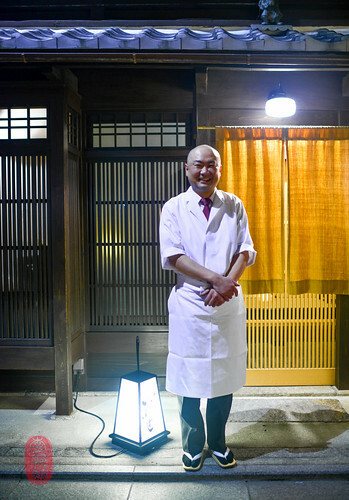 Unlike our kaiseki meals in Tokyo, which spit us out into the bustling, neon-glow of the city’s vibrant night life, the transition from the calm of Ifuki back into Kyoto was much more seamless. Tomo and I slipped into the empty, cobblestone streets of the Gion, threaded with narrow alleyways and mysterious corners lit only by the glow of lanterns swaying gently in the breeze. Every now and then, there was the hushed bowing and farewell of a sendoff into the night, or the steady, hurried gait of a geisha on her way home. Otherwise, our world was still. For a moment, for a night, I was in a different time and place. Dinner cost ¥16,000 (or about $160 at the then-current exchange rate). To see all the photos from my meal at Ifuki, visit the album on Flickr. * A note on geisha culture: Tomo explained to me that geisha are women who have been formally trained to entertain. Young women who enter into geisha life start as maikos. These geishas-in-training can be identified by their heavy make-up, elaborate kimonos and hairdos, and thick, platform sandals. Because of their outfit, maikos do not move very quickly, and can often be seen walking, arm-in-arm, in pairs. As a part of their training, which lasts a few years, maikos are expected to learn how to dance, sing, and recite poetry. At the end of their training, maikos graduate to the stage, performing as geishas. Once a geisha, these women simplify their dress, hairdos and make-up. As a geisha, these women are not permitted to marry; they must leave their career as a geisha to do so. And, contrary to popular belief, geishas are not prostitutes. They are hired strictly to entertain and, sometimes, to keep their clients company, often at extremely high prices (which explains why their audience and clients are almost exclusively wealthy businessmen). Thus, geishas must not only be charming and entertaining, but also knowledgeable about current affairs. Geishas can attain cult, and even celebrity status. After years on the stage, geishas retire. Some, like the three women at dinner with us at Ifuki, continue to work, hiring themselves out to businessmen as escorts to dinner. 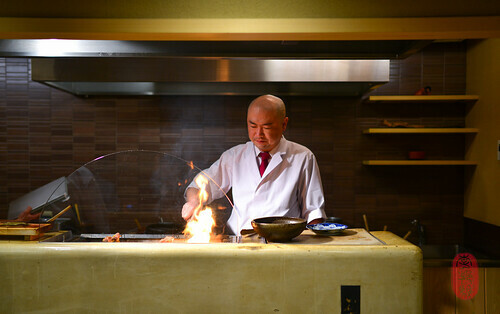 Photos: Chef Norio Yamamoto at his open-fire grill at Ifuki; the Hassun plate; abalone with a sauce of its liver; turtle neck with its liver and eggs; bamboo rice with soup, fish, and pickles; the drink menu; and chef Yamamoto bidding us farewell from the curb. ~ by ulterior epicure on August 28, 2014. I think I went to Ifuki about 3 -4 weeks after your visit. The purple clam is torigai (Japanese cockle) and the one in the soup is hamaguri. Those eggs are indeed non-fully-developed eggs of turtles! We went to a lot of the same places and your reviews are always very spot-on. :) I enjoy them a lot! I definitely want to try after reading your post. How did you secure your booking? And how long in advance do they accept them?